This is not the classic banana bread recipe of your childhood. This really quite lovely banana bread recipe ingeniously calls for roasting the bananas whole prior to incorporating them into the batter. The technique sort of intensifies the banana-y flavor. (Clever, huh?) Although truth be told, we consider this step to be optional—especially those days when you want as little time as possible to elapse between the anticipation of banana bread and the actual incarnation of said banana bread. 1. Position an oven rack in the center of the oven. Preheat the oven to 350°F (176°C). Butter a 9-by-5-inch loaf pan. 2. In a stand mixer fitted with the paddle attachment, combine the flour, sugar, baking soda, and salt and mix on low speed until blended. Add the butter and continue to mix on low speed until blended. Add the eggs, increase the speed to medium and blend until smooth. Reduce the speed to low, immediately add the buttermilk, and gradually bring the mixer up to high speed. Continue to mix until the batter is light and fluffy, stopping once or twice to scrape down the sides of the bowl. 3. Stir in the bananas, vanilla, and pecans just until combined. Scrape the batter into the prepared pan and cover loosely with aluminum foil. Preheat the oven to 350°F (176°C). Line a rimmed baking sheet with aluminum foil. Arrange the bananas in a row on the prepared baking sheet. Using a paring knife, make 6 small slits in the top side of each banana peel. Roast until the peels are black and bulging, with juices oozing from the vents you created prior to roasting, about 15 minutes for regular-size bananas. Remove from the oven and let the bananas cool completely on the pan. Hold one of the roasted bananas over a bowl and begin peeling the roasted banana. The flesh of the banana should fall out seamlessly. Holding the peel of the banana over the bowl, run your fingers or a spoon along the interior of the skins, as you would a squeegee down a window pane, to extract the caramelized juices. Mash the bananas in the bowl with a fork or a potato masher until no large clumps are visible. While this wasn’t my favorite banana bread ever, this was the best gluten-free banana bread I’ve ever eaten. 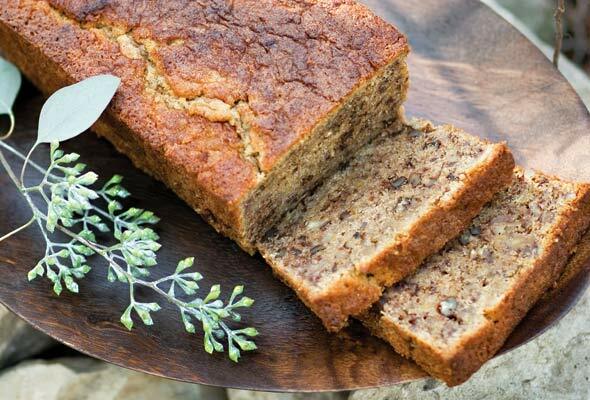 The recipe is easy to follow and creates a texture to regular banana bread that’s nearly spot on— without requiring fun with molecular gastronomy to achieve the results. My co-workers were big fans, too. We’re into muffins and cupcakes as they’re easy to store and a treat for the kids, so I made these as muffins, using King Arthur gluten-free flour mix. I roasted the bananas (as well as the pecans), and found that the roasted bananas made the flavor jump, and also sweetened the bread quite a bit. For future reference, I think 3/4 cup of sugar would be better for me. I froze the rest of the muffins so I can have them for longer than the five days. I am new to gluten-free baking, and this was a good choice. WOW! As one who has friends and family who are gluten intolerant, I’m always on the the search for what I call “crossover recipes,” AKA food that I can serve that will delight all of my guests—those without allergies and those with sensitivities included. This recipe is fabulous. Gluten-Free Banana Bread Recipe © 2010 Karen Morgan. Photo © 2010 Knoxy. All rights reserved. All recipes and photos used with permission of the publisher. As a person with Celiac Disease who also loves to cook; I am very pleased to see gluten free recipes being represented. Thank you. What a great idea – roasting the bananas! Makes perfect sense. I can’t wait to try it. Come to think of it, I bet it would work well with my gluten free apple and pear quick breads and muffins. David – I heard you speak at blogher ’10 in SF – you are witty and approachable, and that’s a good thing! I made this gf banana bread last night. I was concerned when the batter seemed so thin, but it baked up superb. I didn’t have buttermilk, so I used regular milk instead, which was fine, but next time I will used buttermilk. What a wonderful recipe with great flavor and amazing texture. Thank you so much! Not having made it my guess would be that it would be much better with buttermilk. Without the buttermilk there isn’t any acidity in the recipe to react with the baking soda. Having made this recipe numerous times (it still remains my favourite!) I always use buttermilk. As with other recipes using buttermilk it definitely adds great depth of flavour that would be lacking somewhat without. I agree that it definitely does need acidity to react with the baking soda (like in other quick breads, etc.). For Tanya or anyone else who finds they do not have buttermilk in the house, simply add 1 tablespoon of white vinegar or lemon juice to the measuring cup and add enough regular milk to make 1 cup (or adjust accordingly) . Let stand 5 minutes before using. Hint: This recipe is also great with grated bittersweet chocolate! Roasting the bananas made a delicious difference. Great banana bread recipe and a wonderful GF recipe. Easy and delicious. It doesn’t get much better than that. So glad you liked it, Twila! How exactly do you roast bananas? I would love to surprise my gluten-intolerant daughter with this goodie! Hi, Cantella! Glad to have you join us here. Having made this recipe several times (just because it is so darned good, plus I have celiac disease) I would encourage you to roast the bananas as recommended. All you do is poke 6 holes in each of the four bananas, place them on a tinfoil-lined baking sheet, roast about 15 minutes at 350 degrees F, and voila! They add a lovely flavor. I also recommend toasting or roasting the pecans, too, if you have the time. I made this recipe again this afternoon, but this time used my miniature loaf pans to permit me to freeze the breads individually. They turned out very well. All the best of luck with this recipe. Please let us know how it worked out! I found out less than a week ago that I have celiac disease. I was pretty devastated, and on Valentine’s day said “just one more time” and had a high-gluten meal. That went very badly for my poor gut. This is the first gluten-free baking I have done, and let me tell you, this bread is AWESOME. Granted, I have always preferred my banana bread just a tad dense and crumbly (though, like I said, it’s just a tad). Thank you so much for giving me hope for baking. I’ve always been a big baker, and this has let me see that I can still be a baker! I did use light brown sugar instead of standard granulated sugar. And I did roast the bananas. The bread fell apart a bit when transferring to the cooling rack, but the taste and mouth-feel are just superb. Holly, I’m sorry to hear about the diagnosis. I understand your devastation. And because I understand, I’m over the moon to hear that you liked the banana bread. And we have more where that came from. If you go to our Advanced Recipe Search and click on Gluten-Free, you’ll see an array of options. Or you could just click on this link. Let us know what recipes—from our site or others—are satisfying your cravings. In the meantime, we’ll be thinking of you. Thanks for including this and other GF recipes on your site. I had a surplus of both bananas and buttermilk, so this recipe called to me. I made the recipe as presented (including roasting the bananas) with the following exceptions: I roasted the nuts and sprinkled the top with sunflower seeds, and I made it in a food processor. I lined the pan with a parchment sling for easy removal. I am not sure why the cake would be covered with foil; I removed it after 30 minutes since it was sticking to the loaf (which rose quickly to the top of the pan). After 1hr15 minutes the toothpick came out clean, so I removed the loaf from the oven. It was gorgeous and brown, and came out of the pan without a fight. I sliced off the end after 15 minutes or so (I’m not a patient person, and the smell was torturing me) and found it to be still quite wet inside; popped it back in the oven for another 15… still wet. Left it to sit in the residual heat of the oven and hope it firms up as it cools. As for the piece that I ate, while a little sweet for my taste it did have a gorgeous banana intensity and was a good approximation of non-GF banana bread. I will try this again as mini loaves or muffins next time, cut back on the sugar, and perhaps add some lemon rind and extra seeds to the mix. I’m so glad to hear everyone who has tried my banana bread has loved it as much as I do! Thank you everyone for your thoughtful responses-a couple of which I would love to answer. First and foremost is the question of texture. As Renee very astutely pointed out, the size of your bananas will effect the texture and moisture of the bread. Gigantic under-ripe bananas will result in an almost damp, not fully cooked looking banana bread, which is why is is super important to always buy small bananas and to allow them to ripen until they are covered with a confetti party of brown spots for the very best taste, texture and appearance. The riper the bananas, the stronger the banana flavor after they are roasted. The roasting also lends a nutty flavor, which complements the sweet Texas pecans perfectly. When covering the banana bread, I always cover it loosely in the shape of a tent to prevent sticking. You can also lightly spray your foil with non-stick to insure a no-stick rising. Per the bread falling apart when transferring to a wire rack, this is due to substituting the granulated sugar with brown sugar. Brown sugar is extremely hydrophilic–meaning, it retains water beautifully. For cookies, this is a fabulous thing because it helps produce that nice moist crumb, but in breads, it causes weak channels to form, causing the bread to have a difficult time holding its’ structure and ultimately breakage to occur. I hope this shines some light on how to adjust your gf baking techniques and I love to see everyone adding little bits of their own creative flare to the recipes. That’s the heart and soul of cooking–to do what sounds good until you strike upon your own new way. My son has always loved my banana bread (almost straight from Fanny Farmer), and it calls for neither milk nor butter or oil, and it turns out great. His wife is gluten-intolerant, so I’m going to try it with rice flour. (Thanks for the hint about flax. I had been going to add some.) My only variations are that I always add orange zest and 1/4 teaspoon ground nutmeg. Whenever I have oranges, I microplane the zest and freeze it, so always have some on hand–works for lemon or ginger, too. Loved this recipe. Tnx for posting. I use half the sugar it says here cuz I don’t like it so, so sweet. And I added some dark chocolate chips (can’t have anything wo chocolate in it!!!) Also I used Bob’s Red Mill Garbanzo and Fava Bean Flour cuz they were out of all-purpose. Breaks apart a little too easy than I’d like, but I don’t mind cuz it tastes amazing!! Saba, well, howdy-ho. I’m so happy you enjoyed the recipe. Adding the chocolate chips–genius! You’re very welcome, Saba. So glad you loved it. Also so glad you were able to customize it. Baked goods can be temperamental, so the crumbly texture may have been a result of using different flours or even adding the chunks of chocolate–not that we would ever fault anyone for adding chocolate to anything! But seems as though there are no complaints. Do let us know if you make it again with other adaptations, as we’re always curious to learn variations that work…or not. Ok, I made this bread last night. Although, I don’t have a problem with gluten, I thought I’d try it. A. I only used three bananas and I did not roast them. Didn’t have any more than that, nor time to roast. B. I forgot to add the butter and by the time I realized it, it was too late. Despite all that, the bread was superb and people didn’t even notice the lack of butter, but were able to add it if they wanted. Ok. While I’m not a fan of people freelancing when making a recipe, especially for the first time, I think it’s fantastic that the bread turned out and that you and your guests liked it. It’s a sign of a great recipe when it can take such “punishment,” if you will, and still come out well. Ok, kids wanted me to make the banana bread again, but they were ok with me leaving out the butter. So, I made it AND I FORGOT TO PUT IN THE BUTTERMILK!! It was too late for me to take it out of the oven, by the time I figured it out, and warned the kids that we may be eating banana bread pudding. Guess what?! It turned out great! OMG, I wonder what I’m on to? We add butter when we eat it, if we want. The kids are getting a taste of what life will be like when I’m REALLY old. Tom, your comment has made my day. Definitely appreciate the chuckle–and the curiosity it’s inspired! What sort of other empty-pantry hijinx can this bread withstand?! I was reminded of this recipe when I was given a copy of the gorgeous Blackbird Bakery Gluten Free Cookbook for Christmas (score!). On this second try, I followed the recipe except for adding lemon zest and sunflower seeds on top; I used 4 medium-sized very ripe bananas, unbaked. This time I did the foil tent as instructed. Oven calibrated. Good to go. At 75 minutes I pulled the pan out. The foil tent meant that the bread steamed rather than baked, so the top didn’t brown as it did on my first try. I popped it back in the hot oven without the foil for 15 minutes to crisp it up a bit… that helped a little with appearance. I patiently waited 15 minutes for cooling and then took a slice off the end. Verdict: it tastes great but it is still VERY wet in there. No crumb at all, more like a dense steamed pudding; no sign of the texture or colour shown in the image. And there’s Tom, omitting key ingredients yet still finding success…argh! I welcome your thoughts… I would love for this recipe to work for me, but one more strike and its out! We put the question to our panel of recipe testers, Teri. Let’s see what they can do to help you. Hi! Glad you did not give up on the first try. I have celiac disease and have made this recipe a few times now because I enjoy it so very much. It certainly is one of the most flavourful gluten-free banana breads I have ever made. Let’s see if we can help you here. Another tip – were all your ingredients at room temperature? They should be for GF baking. Oh, and one more thing. Measuring GF flour is different than regular wheat flour – you measure by the spoon from the bag into the cup rather than scooping up the flour in the cup from the bag/container. I spray the tent with oil first and barely tent the loaf. Please don’t give up on this recipe as it is sooooo good! I, too, own the book and have made many delicious things from it. It is one of my favourite GF baking books to be sure. Have you tried toasting your bread or even using it as French Toast as it sounds as though it still is too moist? Hopefully your third try is IT. Let us know how it goes! My daughter is gluten intolerant so I decided to try this recipe. Y U M M I E . . . is all I can say!!!! I even made a loaf for a potluck and it went like hotcakes!!!!! Though I have to say it didn’t look anything like the picture posted above. It was more like a bread pudding instead of bread. Hi Centella, the size of the bananas can make a huge difference in the texture and consistency of the finished bread. Have a look at some of the comments above. 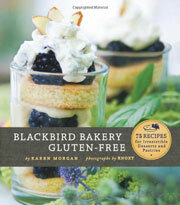 The author, Karen, has a few tips as does one of our gluten free testers, Brenda. Let us know if you try it again and incorporate some of these suggestions. I had to use my food processor to break up the dates so the way I mixed the batter was a bit different. I’ll be posting this on my blog after my Dad gets his loaf. Thanks so much for this awesome recipe! All I can say is…yum! Even my caterer friend loved it. Lora, lovely to hear it! Just lovely. Thanks for letting us know! This recipe was delicious just made it!! Will definitely make it again! Thanks. Terrific! You’re very welcome. So glad to hear you like it as much as we do, Brittany. This is the best banana bread i have had since going gluten free thanks for posting a reciept that does not need mulitple types of flour. It is super easy and best of all delicious. You are so very welcome, Betty. We, too, were wowed by the flavor and wooed by the ease with which the recipe comes together! Alycia, I’m really sorry to hear this didn’t work for you. We made this banana bread several times in our home kitchens and didn’t experience what happened to you. May I ask if you made any substitutions? Did you use Bob’s Red Mill gf flour mix? I’d love to figure out what went wrong and just need to know if perhaps you made any tweaks. Thank you! I made a few small adjustments, Glutino flour, because it’s what I had. But I substituted half the sugar for local raw honey and half-and-half instead of buttermilk. I’m sure it’s amazing either way, but this is a great recipe! I shared the finished product with my neighbors and they didn’t even realize it was gluten-free. It’s really that good! I’m not sure if the raw honey makes that big of a difference but it’s moist and flavorful and I’m so glad I found this. It’s only my second time in making it and I feel like it’s perfect. Anthony, that sounds amazing. And if your version ain’t broke, don’t fix it!